Good morning folks, and welcome to the Friday post that almost wasn’t. Yep, you read that correctly. There almost wasn’t a post today. Why? Well, let’s get rolling on today’s five and you’ll find out. 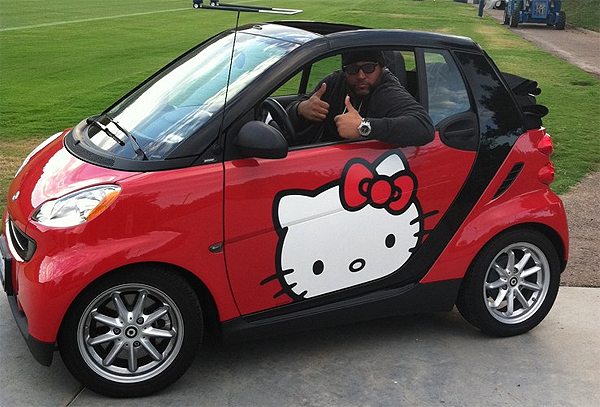 An NFL nose tackle, driving a Hello Kitty smart car. I feel bad for this person, I really do. A man was attacked and severely injured in a shark attack. But I can’t help thinking to myself… “The beach was CLOSED due to shark sightings”. In an area known for great white sharks and shark attacks. You ignored the signs. Not Smart. I got this from my co-blogger earlier in the week. Originally I thought it screamed “This will not end well”. New York Abandons Eye Exams For Driver’s Licenses. Then I drove home, and I realized that in truth – it isn’t gonna make a bit of difference. Okay… Now, why did we almost not have a post today? Because I was almost still in bed. Unintentionally. Yes, today was one of those days that we’ve all had at least once before in our life. You sort of half wake up thinking it’s the middle of the night (or in some cases the daylight tips you off that something is amiss) and blurrily look over at the clock. And you realize that the time staring back at you is far later than it should be and your alarm did not go off. So yeah – the resulting “Oh $h*t” moment was enough to jump start my day and get me going. At least until I got into the office and got some coffee. LOTS of coffee. Even though yesterday was actually National Coffee Day. Okay folks, that’s a quick five (again, apologies but it needed to be a rush job today) and it’s time for me to head off and get ready for another exciting, home improvement filled weekend! Until then – let’s go with a little Alan Jackson music for a change a pace on the way out. Howdy folks, and welcome back to another one of Beermaker’s crazy, silly, occasionally amusing, and always self-indulgent posts in the “Five Thoughts” series. What are we going to talk about on this gray, wet, and rainy Friday? Well… let’s find out! For starters… It’s the first day of fall. And.. The sky is falling! Now, when I said it was raining I meant actual rain. You know, water. Not giant hunks of flaming satellite remnants! Then again, the satellite is only 6 1/2 tons and the size of a school bus so the odds of someone somewhere on earth are only pegged at 3200-1 by NASA. Those don’t seem like great odds, do they? And the destination unknown? That’s bothersome. Not only because of the uncertainty, but because it got this song stuck in my head! Wait – women who DON’T like ice cream?????? Ok, cheap shot, I know. But how can you not get a laugh from this? I have to mention this next article, strictly based on the sheer amazement I felt in realizing the amount of work people are putting into redesigning… A Ketchup Packet!! Seriously… This was a problem? After over 40 years? The old ones stopped working or something? As has been fairly well documented by now, I was out traveling around last week. And I returned home to a dead refrigerator. Actually, it’s wasn’t completely dead. The power was still on and it was recirculating warm air instead of cold. Let’s just say I have a pretty good idea what a dead body would smell like now. And apologies to the trash guys who picked up that garbage can. They probably thought they had found Jimmy Hoffa. Nope, just spoiled beef and turkey. -A Second, (and in this case – a Third) spare refrigerator. Amazing how something like a few cold brews can help out. Okay folks, that’s five and I’m out of here. I’m out of here to start in on my weekend. And as for the dearly departed fridge? You what the worst part was? Not the lost food. Not the money the new one cost us. No, the worst part of coming home to a dead fridge? That Smell. Today was the airing of the original episode of Family Ties. Growing up, I remember tuning in to watch this show every week. I was a huge Alex P. Keaton fan. So much so, that I use to get dressed up in skinny ties. I even believe that his character led me career path wise to where I am now. Say what you will about those tv shows from the 80s, but I never knew that I was growing up in an end of an era for well written sitcoms. Boo to reality tv….BOO!! With apologies to Monty Python…. Folks, it’s time to talk about spam. And not the kind pictured above. I actually like THAT stuff. Did you know they serve it with damned near everything out in Hawaii? It’s true. They even make Spam sushi! No, I’m here to talk about the online equivalent of old postal junk mail. Yeah, THAT spam. Now, I have to admit – most of it is annoying, some of it is obscene, and a lot of it can be downright malicious (Either looking to infect a machine, or steal personal info). But to read some of it.. I have to laugh at some of it. We had a few comments get caught in the spam filter here recently. Most were gibberish – unintelligible links and such with no substance to them. But there were two.. Oh were there two. I think they were just spitting words out of random word generator or something. I couldn’t help but laugh. We particularly treasured learning your distribute. Many thanks!Your area of look at closefisted to be able to the neural all the best, do you consider the Rss feed nutrition ? Who knew an RSS feed needed nutrition? Yeah, I often come to a fingernail. Now if you’ll excuse me, I need to take a transmission. And since the opening of this was designed to hopefully stick this song in your head… here you go! I firmly believe that my co-blogger has cut a deal with the National Association of Alcoholic Beverage Licensing based on his tweets lately. Since I didn’t get any of the money from such deal, I’m making sure I don’t make any reference going forward at this point. I’ll teach you not to share!!!! 1. I have to say I’m pretty impressed that a large enough group of people actually followed through on their threats. A recent article in the Chicago Tribune puts the loss of Customers to Netflix to over a million. Power to the people I say! 2. I recently heard that Kristie Alley was turning 60! That is nuts. For those of you too young to know Kristie Alley before she was on Jenny Craig and before she had a reality show, she was on a little known show called Cheers. Can I just say that they just don’t write TV like that anymore. Sigh. Here’s a great clip for you young kids..watch it and then get off my lawn! 3. Speaking badly of Hollywood again, news has leaked out that they are going to make a Point Break remake. ENOUGH!!!! STOP!!! Point Break is no where near my favorite movie or is it a classic, but it does have a certain vibe about it that made it unique. Hollywood, didn’t you learn from your Conan remake? 4. Now, I will say once again.. There is a New Muppet movie coming out. I can’t wait. Okay, now I just used that as an excuse to post another Muppet video…yeah, I’m that lame. And for a final bonus video clip….oh yeah…I’m going there…. Howdy folks! Yeah, I know.. you can already hear those first few notes… Don’t worry though. I promise, I’m not going to be doing anything involving a black Trans-Am (For the record it’s a 370Z Roadster), an eighteen wheeler (okay..well… maybe), and we are definitely NOT going to either Texarkana or Atlanta. Yes, you are correct though. All this talk means it’s time for another one of Beer’s Boondoggles! So, before Buford T. Justice finds me, let’s get started! 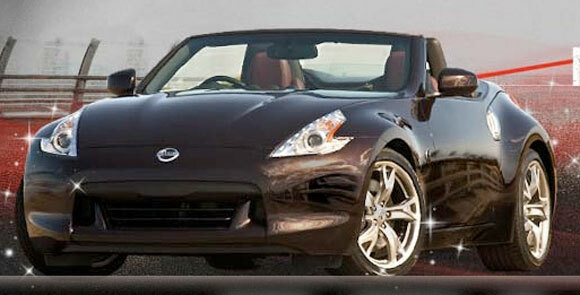 All this talk about fast cars and everything.. How do you even get ready for that. Well, by having your commute make this list. America’s Five Fastest Roads. And frankly, if they think that 81MPH is the avg speed of the top 5% with a top speed of 83MPH is an accurate reading I have some advice for them. Come back when there isn’t snow on the ground. That’s a SLOW day, folks. And yes, there IS traffic. It’s not an empty road. I have to use this one. I mean, how can you not be drawn to a headline like “Drunk Moose in a Tree“. Never saw Bullwinkle do that! Did anyone see Boris and Natasha circling the neighborhood? It’s a robbery, dammit! Well, that’s what he should have said. Invoking the great skit from Eddie Murphy on SNL. “I’m Gumby Dammit!” Sure beats dressing up as Gumby and then trying to rob a 7-11 store. Sadly, I can’t embed the video (linked it above) because I could only find it on Hulu. Still, go watch. It’s worth it. I have no real opinion either way on life beyond earth, but I do know this. If there is life out there, and they come here – they won’t be impressed. Why do I say this? Because NASA has recently released photos showing that we’re such slobs we even litter on the moon! Let’s face it. We’re going to be that intergalactic slob cousin that never gets invited to any family functions. Ah well, Springer re-runs are on anyways..
One more travel note.. well, maybe an oddity. Billie Joe Armstrong, lead signer of Green Day (a band I like very much, btw) was recently removed from a Southwest Airline flight because… His pants sagged too low. Now, I’m no fan of the “Let’s show off our boxers look”, but it does seem a bit trivial to kick someone off a plane for that. Frankly, I’d rather tolerate that look that the “I should have stopped wearing spandex 150 pounds ago” look any day. Still, I have to wonder… Why is the lead singer of a rock band flying Southwest Airlines? C’mon man, party like a rock star! Fly first class. I’ve seen “The Wedding Singer“. Ok folks. That’s five and I’m out of here! Eastbound and Down! On our recent trip home from vacation we encountered a bit of a snafu on the return flight (As my Twitter feed will attest to). Now, it was aggravating, annoying, frankly unnecessary, and in light of the news today… nothing more than an inconvenience. As I write this, news is breaking that a plane crash in Russia has claimed the lives of at least 43 people. The Lokomotiv Yaroslavl hockey team was aboard the jet. I’m tempted to type out some of the better known names, but I think that would be a disservice to all of those who died in the crash. My co-blogger sent me a note with a tweet from TSN hockey writer Bob McKenzie. I think it sums it up. Truly a tragic day for the hockey world. This quote from Kingkielbasa pretty much sums it up for me… “Can we say this is the worst year for “hockey” so far?” Yes, yes we can. That last line will get lost in the shuffle of this horrible news, but it bears keeping in mind for perspective. As upset as we really can get at the little things when we fly “What do you MEAN my bag is too heavy?”, “I’m going to miss my connecting flight!”, “Our seats aren’t together like we requested!”, “My bags didn’t get put on the plane!”, “We’ve been waiting for a gate for an HOUR!” all seem pretty insignificant when looked at through the bigger lens, don’t they? I got home from a trip irritated and 4 hours late the last time I flew. Since June, 90 people flying in Russia didn’t make it home at all. If that doesn’t give you perspective, I don’t know what will.